You are currently browsing the tag archive for the ‘Ciabatta’ tag. If you’ve ever baked bread using yeast, and you are like me, you can stare into the bubbling starter, mesmerized by all the activity going on in that bowl. As you watch, bubbles surface and then disappear, over and over again. Happy yeast munching away. The typical bread I bake is a sourdough ciabatta loaf. I created the sourdough starter that I am using from scratch, using a recipe I found online. Pretty basic stuff, I took a potato, put it in water and boiled it, then used the potato water with all its starchy goodness. I placed that in a mason jar, covered it with cheesecloth and left it on the kitchen counter. It attracted wild yeast in the air. Every day, I uncovered it, gave it a stir and put the cheesecloth back on. After about 5 days, it was bubbling away. At that point, I fed it, adding warm water and flour. Ta Da! Sourdough starter! If you have grapes around when you are doing this, it is good to leave your jar of potato water near them, as that white film on unwashed grapes is actually yeast. The starter I made back then (about 15 years ago) is still what I use today. Anytime I want to make bread, I take out the starter from the fridge, bring it to room temperature and then add some warm water and flour in equal parts to feed it. Starters are coveted, they are unique in the flavor and characteristics that they bring to a finished loaf of bread. Some sourdough starters are passed down through generations and make my little ol’ starter look like a baby by comparison. In fact, there is a project being conducted right now that is examining different starters. It’s pretty neat and can be found at Rob Dunn Lab. They are even soliciting sourdough starter samples for their project to research the DNA of sourdough. I signed up, figuring that I would put my starter into the mix, if they’d like to have it for research purposes. To learn more about the project and sourdough starters in general, here’s an excellent NPR article. Today I made some ciabatta bread and rolls. 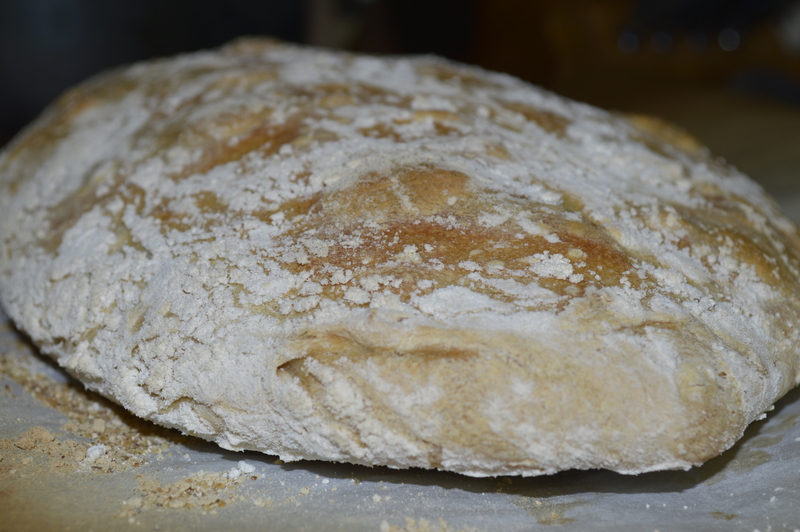 Although the bread I usually make is a sourdough ciabatta recipe, this is a traditional ciabatta using a biga. This is the first time that I used a biga, since my other recipe just uses sourdough starter and no biga. I made the biga last night and let it sit as directed overnight. Mixed the dough this morning and decided to try both a loaf and rolls from the recipe which calls for either two loaves or 16 rolls. Here is the recipe adapted from The Kitchn.com. Dissolve yeast in water. Add the flour and stir to form a thick, gloppy paste. Stir approximately 50 times to activate gluten. Cover and let sit at room temperature eight hours or overnight. Dissolve the yeast in the water in the bowl of a standing mixer. Add biga and stir to break up the large glob it has become. Add the flour and the salt. Stir and let this rest for 10-20 minutes. Using a dough hook, knead at medium speed for 15-18 minutes. Keep a close eye on your mixer as it has a tendency to “walk” on the counter at this speed. The dough will start off sticking to the bottom and sides of the bowl. Around halfway through the mixing time, the dough should slightly pull away from the sides of the bowl, and regularly slap the sides of the bowl. If it doesn’t, turn the mixer speed up a notch. (This is where I noticed that it was still real soupy and not binding together at all and I added another 1/2 cup of flour a little at a time. The dough is still very wet compared to bread dough you might be used to — this is okay and what it is supposed to be doing. Cover the bowl and let the dough rise in a warm spot until tripled in bulk. Dust your work surface heavily with flour. Prepare two baking sheets each with a sheet of parchment. 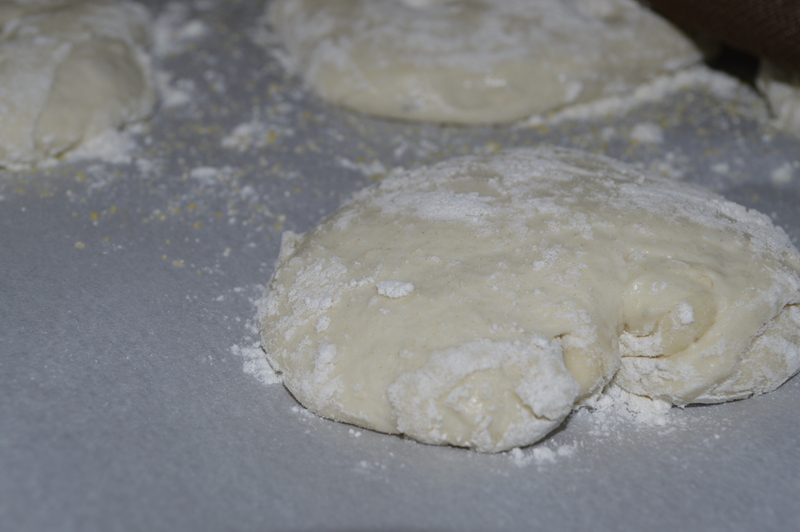 Scrape the dough out on the floured surface and dust the top with more flour. Use a pastry cutter to divide the dough into two if you are making loaves or 16 pieces if you are making rolls. I did half and half — did one loaf and 8 rolls. Brush your hands with flour. Working gently but swiftly, scoop the the loaves (or the rolls) one at a time from the work surface to the parchment. Press your fingertips about halfway into the dough to dimple the surface and slightly flatten. Let the loaves (or rolls) rise, uncovered, for 30-40 minutes. When ready to bake, they should look pillowy with many big bubbles just beneath the surface. When ready to bake, slide the loaves, still on the parchment, onto a pizza stone if you have one. Bake for 20-30 minutes, until puffed and golden brown. Rolls will most likely cook faster than the loaves if you made both like I did. Slip the parchment out from under the loaves or flip them over and cool completely before eating. Ciabatta rolls just before they went in the oven. 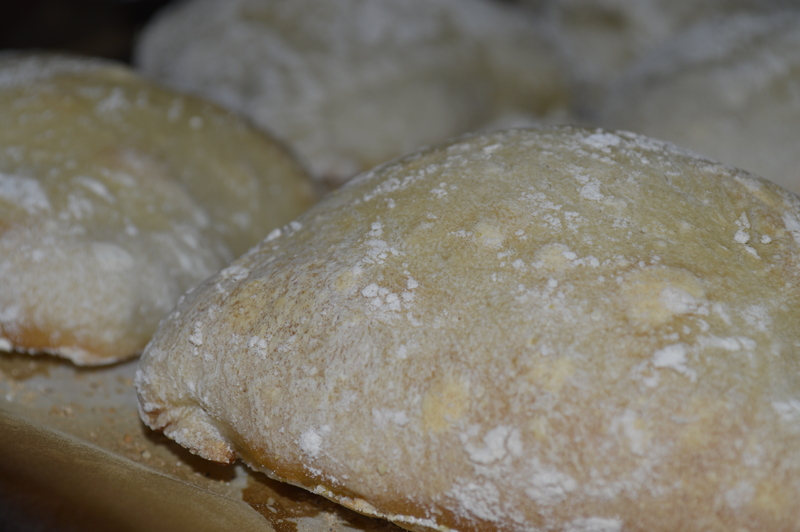 Finished ciabatta rolls — fresh from the oven.